The Hollywood Bowl isn’t the only option for world class, outdoor concerts in Los Angeles. 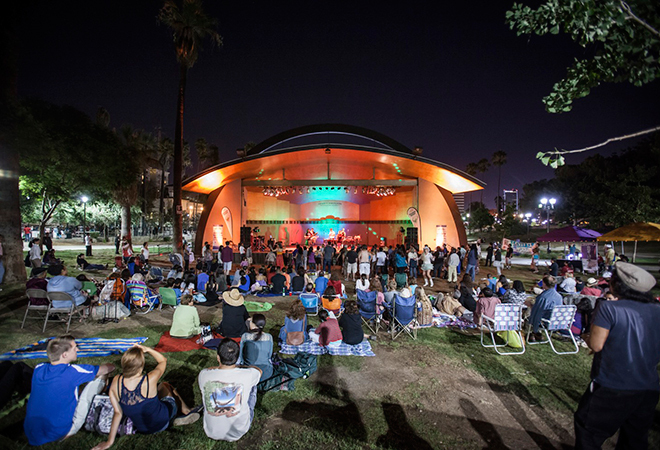 For 11 years people have been enjoying music in Pasadena’s Memorial Park while MacArthur Park has been home to a summer concert series since 2006. The summer season, which runs through the end of August, kicks off at MacArthur Park this weekend with Ozomatli. Next weekend jazz artist Barbara Morrison launches the Memorial Park season. In MacArthur Park, music fans will have a chance to check out acts like Mike B., Young Dubliners and Quetzal, while Pasadena puts a greater emphasis on jazz and still including world music and Americana. Previous articleDoughnuts & Bourbon, Filipino Pop-Up in K-Town, and More!